It’s been a long winter, and the white stuff is still on the ground in some parts of the province. But take heart! Spring is finally here, and so comes a little “housekeeping” to keep things in order. Sweep and Wash Roads… Check! All that sand and salt we lay down during the winter has to be cleared to help keep you moving smoothly. Our maintenance contractors sweep an average of 56,000 km of road each year – that’s about enough road to cover four and a half round trips between Vancouver and Charlottetown, PEI. Sweeping can create dust, so our maintenance contractors apply water to keep dust down, maintaining visibility. Sweepers travel at about 50 km/h, so there may be significant gaps between the advanced warning signs and when you encounter the actual sweeper (since they can cover long distances). Stay alert for sweepers ahead, watch for the flashing lights on the sweeper unit, and never attempt to pass on the right. And please be patient — on narrow, two-lane segments, sweeper operators will often pull off to the side to allow passing when there is enough space. Here’s a quick video showing what a difference a sweep and a wash can make to highways after a long winter. Sweep and Wash Bridges… Check! 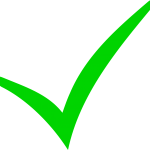 Bridges are a big part of BC highways, and so it makes sense that our spring cleaning checklist also includes annual bridge cleaning. Bridges take a beating with anti-icing and winter abrasives every winter. We start by removing dust and debris, moving it toward the end of the bridge, which prevents it from entering below waterways. When it’s time to wash, we block the deck drains to prevent water from falling below, and spray the bridge using a tanker truck and power washers. By directing the water toward the bridge approaches (away from the river, stream, etc. ), it can be filtered by surrounding earth and vegetation. 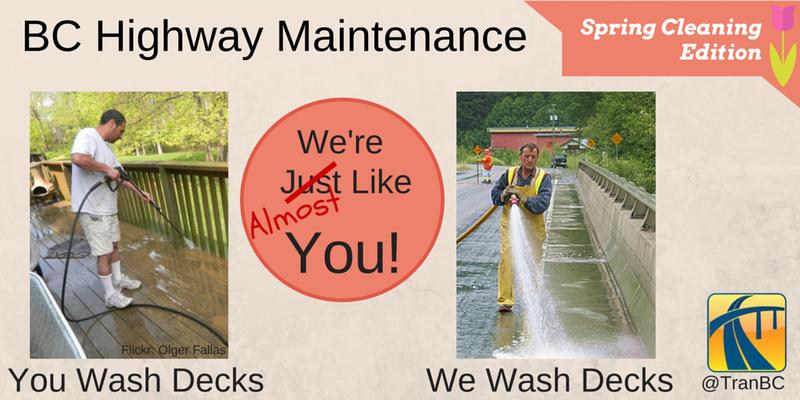 Interested in learning more about best practices for bridge washing? Take a look. Enforce Seasonal Load Restrictions for Heavy Vehicles… Check! As temperatures begin to rise, roads start to weaken. Thawing releases water in the road, which can’t drain efficiently if the surrounding soil remains frozen. This reduces the road’s ability to support heavy loads. When load restrictions are in place, drivers of long haul transports, logging trucks and heavy equipment transports may be required to reduce the load they would normally plan to carry on a route. In some cases, there may be an alternate route without load restrictions. Learn more about how heavy loads can damage spring roads. Brushing those trees and shrubs… Check! As spring kicks in, trees and shrubs start growing; if left unchecked, they can quickly take over our roadsides. So we begin our annual routine of mowing, chopping and chipping to keep things clear. We’re not just doing this for cosmetic reasons; it’s about safety. Prepare for rising water levels… Check! You may have heard us talk about freshet (snow melt typically occurring from April to July). 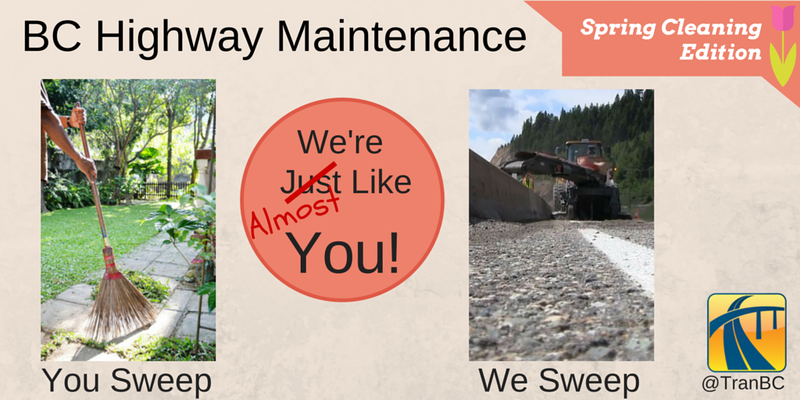 Now that it’s spring, we’re getting ready to protect your highways and bridges from increased water levels. We’re stockpiling sandbags and rip rap, just in case, in an effort to keep you safe and dry. Learn more about our role in keeping floodwaters at bay. Now that you know our approach to spring cleaning, tell us… where do you want to travel (once all your spring cleaning is finished, of course) this spring/summer? Hi, is there a way to find out where trees are being cut down near highway so we can follow to pick up wood? We only remove trees on the right of way and only when they are considered dangerous to the traveling public and or private property. We try to leave the dead tree in its natural environment and the general public is not allowed to take out the tree due to the liability and risk to the ministry if they hurt themselves or others. If we take out a number of trees for a project we work with Forests, Lands and Natural Resources to coordinate, as they own the rights to the timber and not us. Make sense? Let us know if you have any other questions. I am a resident of Campbell River, BC on Vancouver Island and regularly use the Inland Hwy. for cycling. This season, however, the Inland Hwy. has been difficult for riding as the shoulders of the highway have excessive gravel, wood debris from logging trucks and other debris. The areas in need of most attention are from Campbell River to the intersection at Cranberry Lane (gravel, rock and logging trucks are leaving a lot of debris in the shoulders). I have had at least a dozen flat tires this season from the poor shoulder conditions on the Inland Hwy. Shoulders close to bridge decks on the Inland Hwy. are also in poor condition from debris. Wow – that’s a lot of flats – we are sorry to hear this. Please connect directly with our maintenance contractor Mainroad North Island on this issue. I was happy to note that the ministry of transportation does ‘spring cleaning’ of our highways. Unfortunately, our Abbotsford highway connector, Hwy 1 to Mission, has been sadly neglected for some time now. No sweeper has been along this route! The debris on the off and on ramps from Old Clayburn Rd to Hwy 11 is absolutely inundated with garbage. Living in this location, I use this route frequently and I find the litter offensive. I have travelled to a multitude of countries including third world and this highway is looking now more like some of those third world countries! Who is responsible for the cleanliness of this part of our community? Please connect with our maintenance contractor in the area directly. Please connect with Mainroad Howe Sound, as they are directly responsible for the cleaning of the road and will be able to tell you if/when the road will be swept for spring. Thanks for the explanation of how road maintenanance contractors help provide safer travel conditions during Spring. Good info; good work! How does one go about getting contractors to change dangerous conditions at intersections with main highways, like the ones North of Clinton, B.C.? I’ve spoken to the Supervisor and the local RCMP Detachment Commander without results. Yes, it’s almost line painting season (and Highway 3 around Manning Park is on our to do list) – if only we could get the “spring” weather to co-operate! “Spring” made a brief appearance last week…but it ran away! What I wouldn’t give for a nice long stretch of nice weather…tour the southern interior etc. I know the Okanagan Valley is spectacular when it’s sunny and warm out! While we are longing for nicer weather, we hope it doesn’t get too hot too quickly, as that might mean flooding and a delay to those nice road trips! Sadly it appears some flooding is already happening with more forecast in the near future. If it’s not one thing it’s another lately. Wish all the best to those filling and placing sandbags and doing what they can to mitigate damage!